When I walked out of the theater after seeing the movie Avatar the first time, I was stunned. I said to my husband, "This is what the mystics and shamans and holy men and women have tried to say for centuries. We are all connected." That led to the idea for this article, which laid dormant while I conjured up some other projects. But then Gaia, the Earth Mother, whispered to me. "You know, Eywa and I are sisters. I have the same abilities as she does. But the people that live on my surface are mostly unaware of it." I then promised Gaia that I would spread this message the best that I was able. The enormity of the task overwhelms me at times. How do you speak for a goddess? This is not an article to be rushed through. I recommend taking the time to just sit with the ideas and concepts, watch the videos, and listen to the messages from many different cultures. for whom the bells tolls; it tolls for thee. The storyline is weak, trite, and clichéd. The characters are one-dimensional, flat, and unoriginal. It is anti-corporation, anti-industrialism, and racist. An anti-smoking group was upset because there is a character who chain smokes. The Na’vi are basically American Indians and the plot is basically Dances with Wolves. To complete this picture I must mention that Avatar is an Illuminati propaganda film filled with Satanic symbols. I am not even going to provide the reference for this. If you want to know more, plop Avatar and Illuminati into Google; there is plenty to read. I like the movie Dances With Wolves and have watched it many times. What irks me more are the numerous remakes of old classics, as if the original was not good to begin with. And let’s not even talk about the plot of horror movies and slapstick, potty humor movies. As for the Vatican’s comments, that is to be expected. And in my case, totally ignored. I do believe in a nature religion, so we have no argument there. Sometimes we get a little too carried away with finding the tiny flaws and miss the total picture. This is what I want to discuss in this article. I would be remiss if I didn't recommend everyone add this movie to their film library. This is the special collector's edition with more than three hours of bonus features. I recommend watching the director's extended version because it provides more explanation of some of the scenes in the movie. There is also a short documentary called "A Message from Pandora" highlighting James Cameron's work supporting the indigenous people in Brazil who have been fighting to stop the construction of a hydroelectric dam. does not live or breathe. Plato's Allegory of the Cave By Veldkamp, Gabriele and Maurer, Markus via Wikimedia Commons. I am not sure if James Cameron intended this, but I view the movie Avatar as a spiritual allegory. A well known example of an allegory is, of course, Pilgrim’s Progress by John Bunyan. There is also Plato’s “Allegory of the Cave,” and Siddhartha by Herman Hesse. One of my favorite little books is The Holy Man by Susan Trott, which told the story of a group of people standing in line to see a holy man living at the top of a mountain. The story revolved around interactions between the people themselves, and what they learn while they are waiting their turn. Examples of allegorical movies include Matrix, WALL-E, and 2001: A Space Odyssey. So let’s revisit the movie Avatar in terms of a spiritual allegory. Allegories rely on symbols to connect to a deeper level of understanding. Often the story line is not the true story. The intent is to increase our consciousness towards something, to force us to look at something with different eyes. I was intrigued by this press release from The New Parenting Club entitled "Why Avatar Didn’t Win the Oscar.” Psychologist Dr. Jeffrey Fine says the reason is simple: Avatar didn’t win because the Academy missed the movie’s deeper meaning. Dr Fine believes everyone should see the movie. He says unless we wake up to Avatar’s message, humanity will be lost. Those are pretty strong words. But they are not new words. As I said in the introduction, indigenous peoples have been telling us for centuries that we must honor the Earth. Scientists are also beginning to send the message that we are all connected. Let’s explore that in greater depth. ​We are earth people on a spiritual journey to the stars. Our quest, our earth walk, is to look within, to know who we are, to see that we are connected to all things, that there is no separation, only in the mind. 1. The Earth is alive, self-directed, with it’s own primal consciousness. 2. Life is inspirited and thus sacred with an innate, intrinsic value. 3. All elements of the sacred Whole are interconnected, interdependent, and interrelated at the deepest levels…..and all should be treated as our relatives. This essay mentioned above is one of the chapters in Jesse Wolf Hardin’s book, Gaia Eros: Reconnecting to the Magic and Spirit of Nature. he survival of the world depends upon our sharing what we have and working together. if we don’t, the whole world will die.First the planet, and next the people. We are all pretty familiar with the impact the arrival of the white man had on the indigenous peoples of the Americas, right? When I was growing up, I watched a lot of cowboy and Indian shows and the Indians were almost always the bad guys. It wasn’t until I took a class in college on Native American history that I learned the true story. But all that is behind us now. We’ve learned our lesson, or have we? The truth is that tribal peoples are still continuing to lose their land and their culture. The picture of the bulldozer in the movie Avatar is not just a symbol of corporate greed, it is a reality of life for many indigenous tribes. What I am about to show you is just the tip of the iceberg. The daily news is filled with which movie star is going to jail or who is divorcing whom. Yet these stories of injustices being done to the indigenous peoples around the world are much more important. Here are some examples from the website Survival International, which reports the abuses not from a 100 years ago, not 50 years ago, but still going on today. At risk of extinction from disease and land loss In the depths of the Amazon rainforest in Brazil live tribes who have no contact with the outside world.Illegal loggers and cattle ranchers are invading their land and bringing disease. They won’t survive unless this stops. In Arizona, the Navajos continue to fight the results of uranium mining which, contaminated their homes and caused widespread lung disease.. Although cleanup has started on a few sites, there are still hundreds of mines that continue to pollute the land and water where the Navajo tribe lives. In case you think that the movie Avatar was exaggerating the scope of the damage, In 1994 a bulldozer driver clearing the forest at night was attacked out of the darkness. Although he didn’t know it, he was destroying the gardens and hunting grounds of a group of Ayoreo-Totobiegosode families. One of the tribal members, Esoi, was finally forced out of the forest in 2004. Here, he recounts his attack on the bulldozer. Go behind the scenes with this book with over 100pictures. Most popular movies these days seem to generate sequels, some not a well received as the first one. There was no doubt that James Cameron would follow his success with a sequel to Avatar. In fact he has been busy creating the sequels 2, 3, and 4. He is also including sequel #5. At last some good news. Indigenous peoples are key to preserving the world's forests, and conservation reserves that exclude them suffer as a result, according to a new study from the World Bank. Aboriginal Indigenous spirituality and Aboriginal beliefs explained from a perspective of Indigenous spiritual sources and Aboriginal people. "A network of Indigenous Peoples empowering Indigenous Nations and communities towards sustainable livelihoods, demanding environmental justice and maintaining the Sacred Fire of our traditions." "In the Pagan view, ecocide is a heinous crime on a level with genocide-for indeed, to kill an ecosystem is to destroy the people and cultures that depend on it for survival." It's a nice synchronicity that Starhawk called her webiste the "Tangled Web." There is so much information to be found there. ​Starhawk has written a series of three fiction novels of the future, She envisions a future filled with violence and chaos, but also an urban oasis where the people value non-violence and equality and are interconnected with nature. "At the deepest level of ecological awareness you are talking about spiritual awareness. Spiritual awareness is an understanding of being imbedded in a larger whole, a cosmic whole, of belonging to the universe." I am not a science expert. It was not one of my best subjects in school, and physics was, and still is, a complete mystery to me. 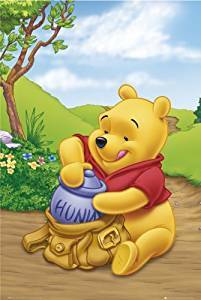 I can relate to Winnie the Pooh when he said, "I am a Bear of very little brain, and long words bother me"
Nonetheless, science is important to our discussion so I will attempt to point the way. In the one physics class I took in college (which scared the heck out of me), we read the book Physics for Poets by Robert March. I have to say that the title received not a little laughter from the "real" physics students at another college which specialized in engineering. But somehow I "got" this book, because even in the 197's it was telling me that somehow science and spirituality were related. "The new physics has spawned an equally modern metaphysics. " Physics for Poets, 1970, Richard H March. So, you see, I was getting the idea even then. But it has taken years for it to work it's way into my mind and make any lasting impression. Videos such as "What the Bleep Do We Know?" have helped open that doorway even more. Since we have established that I am not a good resource in this realm, I leave it to others more knowledgeable than me to point the way. ​5th Edition of the book I had in college .A perfect beginners text for those who would benefit of an explanation of physics written in a non-technical way. "Quantum physics is beginning to realize that the Universe appears to be a dynamic web of interconnected and inseparable energy patterns. If the Universe is indeed composed of such a web, there is logically no such thing as a part. This implies we are not separated parts of a whole but rather we are the Whole." Barbara Brennan, a former NASA scientist, in The Hands of Light. With respect to Carl Sagan, who returned to the cosmos on Dec. 20, 1996. The other link is to an interview with Dr Rupert Sheldrake in Superconsciousness Magazine. The Symphony of Science is a musical project headed by John Boswell, designed to deliver scientific knowledge and philosophy in musical form. Here you can watch music videos, download songs, read lyrics and find links relating to the messages conveyed by the music. An interview with Dr Rupert Sheldrake by author Danielle Graham discussing morphic resonance which Dr Sheldrake explains as "is the way that things tune into each other." "A human being is a part of the whole, called by us, "Universe" a part limited in time and space. He experiences himself, his thoughts and feelings as something separated from the rest - a kind of optical delusion of his consciousness. This delusion is a kind of prison, restricting us to our personal desires and to affection for a few persons nearest to us. Our task must be to free from this prison by widening our circle of compassion to embrace all living creatures and the whole nature in its beauty." "Cosmic Tree of Life derives from my interest in science and has driven me as an artist to view how profoundly connected we are to a vast fine-tuned universe that has in the past 75 years brought about an extraordinary higher consciousness of our place in the universe. This emergent view now touches all of us to the extent we are the participatory guardians of precious planetary life and this consciousness may well point us towards spreading life throughout the solar system and beyond... None of this will be possible without respect and reverence for mother earth, life and science." I realize that I have given you a lot to think about, and some of it is disturbing. So I want to end on a note of hope. ​The Na'vi used the words "I See You" to say "I see the spirit in you." "Namaste" is a Sanskrit word which means "I honor the Spirit in you which is also in me." This is a beautiful video to lift your spirits and give you hope for the future. I didn't realize how passionate I was about this subject, until I was well into the writing of it. At first, I felt nudged to write something after the movie Avatar ​came out. Then I began to experience more and more synchronicities regarding webs and spiders. As I worked on it, the references became more and more evident, until I couldn't pick up a book without reading something about webs. I have to confess that I still need practice in walking my talk. I like the luxuries of modern life like air conditioning. I have become better at recycling, but could still do better. I fundamentally understand the concept that we are all connected, but have many days where I love humanity and can't stand people. Still, it is important to become aware of our connection to everything and make an effort to raise our consciousness. There is one famous quote that I deliberately left out. That is the one that is usually attributed to Chief Seattle. "Man did not weave the web of life, he is merely a strand in it. Whatever he does to the web, he does to himself." The reason I left it out is that research has revealed that Chief Seattle did not actually say these words. They were attributed to him by a writer of a screenplay and the character playing Chief Seattle said those words. Even so, the quote is an excellent one, it was just written by a white man in the 1970's rather than a Native American. Does that make it less valid? The true author is Ted Perry and he did not intend that it would be so thoroughly misrepresented. ​I would love to hear your thoughts on this topic. Comments are welcomed at my blog post "More Synchronicities" where I share my thoughts on my process of thinking while writing this article.